From The Los Angeles Times. 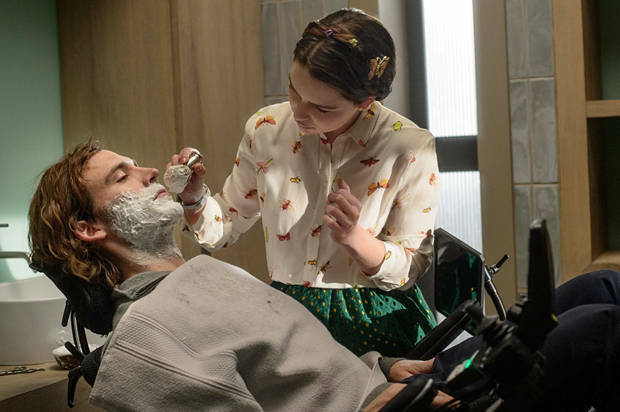 Pictured are Sam Claflin, a nondisabled actor playing disabled, and Emilia Clarke in 2016's "Me Before You." When Hollywood discusses diversity, one community is often left out of the conversation: people with disabilities. Even in its most recent iterations, prompted by #OscarsSoWhite, differently abled people in the industry seem unable to find a seat at the table. A recent study by the Ruderman Family Foundation revealed that, despite those with disabilities representing nearly 20% of the country’s population, about 95% of characters with disabilities on television are played by able-bodied actors. “The protest and ensuing media frenzy ignited by the ‘Oscars So White’ campaign has shaped an ideology around diversity in entertainment,” actor Danny Woodburn, a coauthor of the report, said in a statement. “This off-balanced idea of diversity has led to policy and even proposed legislation that has excluded people with disabilities. The Ruderman White Paper on Employment of Actors With Disabilities in Television is our attempt to bring perspective to inclusion, to reinforce access and an understanding of authenticity as an expression of what true diversity means and to finally let the least represented group in this medium be heard." Woodburn (“Jingle All the Way,” “Seinfeld” and “Teenage Mutant Ninja Turtles”), who as a little person counts himself as a person with a disability, cowrote the report with Kristina Kopić, an advocacy specialist with the Ruderman Foundation, an internationally recognized organization that advocates for the inclusion of people with disabilities. Surveying hundreds of actors with visible and non-visible disabilities, they found that a plurality of actors with disabilities worked less than once a year and were repeatedly subjected to negative stigma and preconceived biases by casting agents and producers. The report also examined how often actors with disabilities appeared on the top 10 television shows of the 2015-16 season. The study looked at 31 shows, including streaming platforms, and found that only four actors with disabilities were cast, or less than 2% of all actors on screen. Additionally, the study cites GLAAD’s “Where Are We on TV” report that noted that characters with disabilities on broadcast programming dropped from 1.4% in 2014-15 to 0.9% the following season. When taking into account that 95% of these few roles are filled by able-bodied actors, the true extent of the misrepresentation is evident, the report stated. Ruderman and Woodburn cowrote a July 11 op-ed for The Times titled, “Why Are We OK With Disability Drag in Hollywood?,” in which they outlined how the industry could rectify this situation. The Ruderman Foundation intends to bring the major studio heads together this fall in Los Angeles to discuss the report’s findings and possible corrective measures. A line of hundreds stretched around the block outside the Columbus Theatre in Providence Thursday night, as fans eagerly awaited the worldwide premiere of Spring Break Zombie Massacre and the arrival of its two stars. A police car cruised by, siren blaring, followed by a tricked-out white SUV blaring music and covered in fake blood and zombie corpses. The crowd around the red carpet parted as Sam Suchmann and Mattie Zufelt, better known as Sam and Mattie, stepped out of the truck to wild cheers. Five years in the making, Sam and Mattie’s dream was now a reality. Sam, 20 and Mattie, 21, have been best friends since meeting at the Special Olympics in elementary school. As Sam’s older brother Jesse Suchmann tells it, where one goes, the other isn’t far behind. Back in 2011, when Jesse was visiting his Rhode Island family home on a weekend away from his current residence in New York City, Sam told him he had an idea for a movie about zombies. And he was going to be the star. While Jesse said he encouraged Sam right away, he hadn’t counted on Sam being so persistent. Each time Jesse came home, Sam asked him about filming scenes for the movie. Eventually, the two of them sat down with some construction paper and worked on storyboards. Soon, they had a full-fledged movie about two bionically-enhanced heroes named Sam and Mattie who fight zombies, demons, and zombie-demons, all while juggling beautiful girlfriends and finding time to skateboard, stop bullies, and party. In October 2014, Jesse started a Kickstarter campaign, filming a goofy video of Sam and Mattie introducing themselves and sharing their vision. After Kickstarter featured the campaign on their site on Halloween and a few media outlets took notice, the project took off, raising almost $70,000 in a little over a month. Before launching the Kickstarter campaign, Jesse had begun to solidify a team of friends to help make the movie a reality, including the film’s director, his high school friend Bobby Carnevale. Jesse and Bobby, along with editor Tim Forster and producer Suzy Beck, were the core four supporting Sam and Mattie’s movie. According to Carnevale, they each had to call in dozens of personal favors and reach out to lots of different people to make the film happen. Among the bigger gets were a set of cameras donated by Panavision and assistance from the special effects company Silver Screen, which has worked on shows like The Walking Dead. Though there are still a few special effects that are a bit more DIY (or “Michel Gondry-esque,” as Carnevale calls them), the zombies, demons, and zombie-demons that populate the movie wouldn’t be out of place in a major Hollywood picture. Special effects and fancy cameras aside, though, the film — and the filmmaking process — wouldn’t exist without Sam and Mattie. They are in every scene and were involved in every step of the process, including casting. If you know a bit about Sam and Mattie, you can see how much of themselves they put into Spring Break Zombie Massacre. On days when their energy wasn’t quite as high, Sam said, they “drank a lot of root beer and kept going.” In the film, the traditional spring break scenes are filled with chugging, shots, and funnels of soda. In real life, the team scrambled to finish filming before Mattie entered his college transition program, ultimately wrapping with two days to spare. In the movie, the duo goes from being the kings of their high school to big men on a college campus. Perhaps most tellingly, Mattie hopes to one day become a famous DJ (with Sam as his manager), and counts Rhode Island native Pauly D as one of his heroes. In every Kickstarter update and media appearance they made, Sam and Mattie mentioned that they wanted Pauly D to be in their movie. And in a climactic battle scene, theJersey Shore star and DJ makes a cameo. Thursday night’s world premiere isn’t the end of the road for Sam and Mattie, however. Throughout the entire process, the core four have been shooting a documentary showing every step of how Sam and Mattie’s movie came to be. A film crew was still shooting as the boys walked the red carpet outside the Columbus. 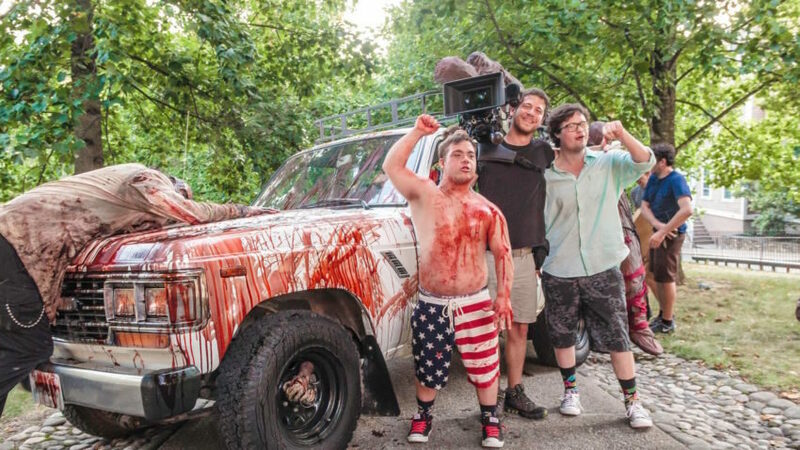 Though Carnevale once said he envisioned Thursday’s premiere as the perfect end to the documentary, Jesse says that Spring Break Zombie Massacre has been accepted to multiple film festivals, and they hope to hold screenings of the movie in other cities (including Boston), so they’re going to keep going. As Spring Break Zombie Massacre concluded Thursday night, the crowd stood and cheered in unison, only sitting once Sam and Mattie took the stage for a Q&A. When asked if the film was everything they imagined, Mattie was blunt. When asked what lessons they wanted to share from their experience, Sam’s message was simple. Chris Van Etten might not be the model you're used to seeing on billboards or in the pages ofGQ. Sure, he's got the chiseled abs and biceps, but unlike your prototypical cover boy, Van Etten wears prosthetics in place of his legs, both of which he lost during an explosion while fighting in Afghanistan in 2012. To try and stop himself from experiencing post traumatic stress disorder, the 25-year-old began working out which eventually landed him in front of the camera. "I wanted to find a way to show the image of strength," he explained to People magazine. And his new underwear campaign for Jockey, Show 'Em What's Underneath, is doing just that. Van Etten, who also spends his time riding his motorcycle, playing wheelchair lacrosse and mono-skiing, was one of three "everyday heroes" that Jockey chose for this campaign to "celebrate the spirit of individual" and to "encourage all people to be comfortable with themselves." "The one thing I want everyone to know is that you don't have to be famous or extremely gifted to change the world," he told Today. "I was an ordinary person and through determination I was able to make the best of it. It's amazing what people are capable of." These ads come at a time when the fashion industry is inching toward greater diversity — at least when it comes to race, gender and body types of size. Spring fashion campaigns, for instance, were the most racially diverse on record as 21.8% of models cast were of color. And last year's New York Fashion Week: Men's also included men of an assortment of different skin tones. As of late, major magazines from Sports Illustrated to Maxim have featured plus-size women, while various models have launched campaigns and clothing brands working toward great inclusivity for women of size. In addition to this, transgender women, like Caitlyn Jenner and Hari Nef, have landed major publication's covers. Those with amputations or disabilities, on the other hand, aren't as visible in the industry. But, there are definitely a few models looking to change this. Rebekah Marine, who was born without a right forearm, is a model who has previously made headlines for walking in NYFW for FTL Moda and posing for People magazine with fellow amputee and veteran Brian Taylor Urruela. "I think it's so cool to be at the front of the line of this change, and being able to open the door and inspire others to open their minds to different models," she told Time back in September. And they're not the only ones. Gianna Schiavone walked alongside Marine during February's NYFW show. Another model, Lauren Wasser, who had her lower leg amputated after contracting toxic shock syndrome, also walked in February, but for clothing brand Chromat. By increasing visibility and making their voices heard loud and clear, these models with amputations are showing others, especially young people, what is possible despite any and all differences. As Van Etten said to Today: "I can make something good out of the situation I've been put in. It's humbling and empowering all at the same time." 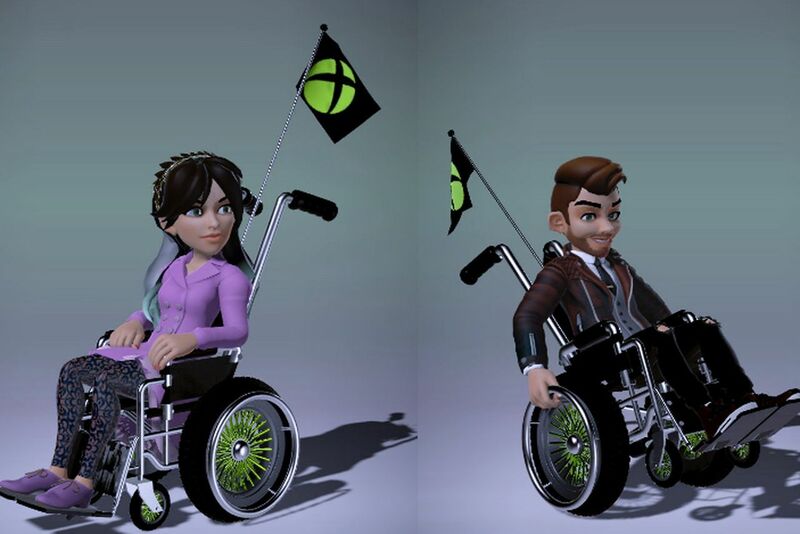 Microsoft is adding wheelchair options for its Xbox avatars, as well as what look like some visual tweaks. Phil Spencer, the company's Xbox head, confirmed that the wheelchair additions were not "far off," after responding to a question on the subject on Twitter. The company's Mike Ybarra then tweeted a "sneak peek" of the update showing two avatars using distinctly Xbox-themed wheelchairs. The facial features of the two avatars also appear to be more detailed than those of previous models, suggesting that there are other visual updates on the way. Microsoft first introduced its avatars on the Xbox 360 in 2008, steadily adding more customization options, including branded content from games and companies. It's not clear when the next update for the avatars will be available, but the Xbox itself will be getting its next big update with the release of a new slim version in August.